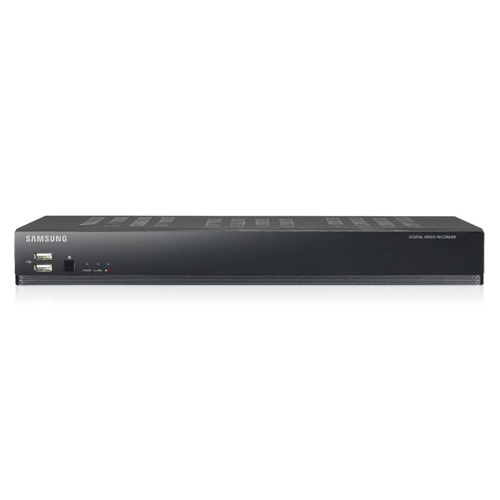 The Samsung SRD-840 is a 8-Channel DVR that allows real-time CIF recording across all channels as well as recording up to full 4CIF with lower frame rates. Slim form factor DVR allows a small foot print while providing no loss in quality features and incorporates a user friendly GUI with multiple record, search and playback modes. The unit provides USB ports for easy back up and mounse control, Two Way Audio as well as RS-485 for PTZ Security Cameras and System controllers. H.264 compression technology allows you to save on storage space while also minimizing the bandwidth requirement for operations. The SRD-840 offers advanced features for remote viewing including webviewer applications, cms software including smart phone support for Android and Iphone. Highly reliable Linux based unit with easy operation and professional surveillance attributes like digital watermark make it high grade yet cost effective . The Samsung SRD-840-500 has many exciting features for users of all types. You can extend the lifetime of your Samsung SRD-840-500 with the purchase of a FactoryOutletStore Factory Protection Plan. The Samsung SRD-840-500 is sold as a Brand New Unopened Item.